GuruFocus calculates the Shiller P/E ratio of individual stocks and different sectors. 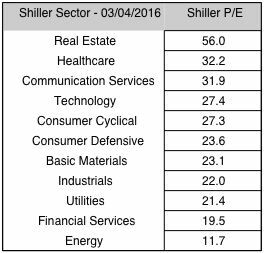 Here you can see the Sector Shiller PE that shows you which sectors are the cheapest. CONCLUSION: Healthcare, the favored sector in the past, should be invested in only on a highly selective basis. The mean value of the Shiller P/E is 16.4, therefore financial and the undervalued energy sectors offer the most attractive prospects at this time. Stay in cash until you can discover promising energy and financial services opportunities. 1. When the market is fair valued or overvalued, buy high-quality companies such as those in the Buffett-Munger Screener. Utilities and industrials are such prospects. 2. When the market is undervalued, buy low-risk beaten-down companies like those in the Ben Graham Net-Net Screener. Buy a basket of them and be diversified. Financial services and energy fits this category. 3. If market is way over valued, stay in cash. Shiller P/E is 52.1% higher than the historical mean of 16.7 or "regular mean" of 22. Implied future annual return is only: 0.2% which is less than can be earned in saving deposit of 1%.